D1 Xtreme SSD | DREVO :: Game With Cool Tech. 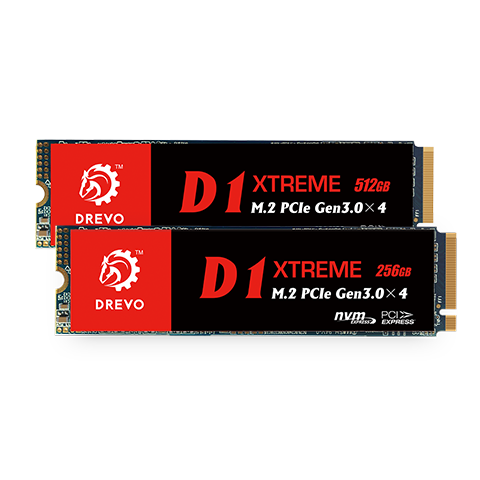 Combining the SMI 2262 Controller with the latest 3D NAND Flash, NVMe 1.3 Protocol and 256MB DRAM Cache, D1 Xtreme delivers insanely fast Input/Output performance. The latest technologies also ensure its reliability and durability. DREVO D1 XTREME is an engineering marvel that integrated TRIM, Thermal Throttling, S.M.A.R.T, End-to-End engine, wear leveling and Intelligent Power Loss Detection techniques to ensure that it could stay relevant and future-proof while delivering unmatched performance. SMI 2262 Controller, combined with PCI-E ×4 Gen 3.0 Lane and NVMe 1.3 Protocol, promotes Seq. Read/Write speeds up to 3000/1200MB/s, and IOPS 4k random R/W up to 200k/250k which are almost five times faster than a normal SATA III SSD. You’ll never encounter a loading screen while gaming or video editing again with D1 Xtreme SSD. Equipped with SMI newest controller that features dynamic thermal guard protection, D1 Xtreme will always ensure data safety even under heavy load. AES Engine and TCG Encryption protect data from loss and falsify. Besides, Firmware Backup Mechanism will make it a very dependable partner. Combined with LDPC and RAID Technologies, D1 Xtreme provides MTBF up to 1,200,000 hours and TBW up to 380TB. It is also strongly backed by a 3-year limited warranty. We insist on maintaining stringent quality standards as well as prompting after-sales service. Higher Performance: PCIe NVM Express SSD with 256Mb/512Mb DRAM cache, reads up to 3100Mb/s and writes up to 1600Mb/s; 4K IOPS Read/Write 250,000/350,000(based on 512GB). Boost up your desktop PC or laptop performance. More Efficiency: Equipped with SM2262 controller, featured with dynamic thermal guard protection, it ensures your data safety even under heavy tasks. Latest 3D NAND Flash: Conceived for solutions requiring low latency, low power consumption and top speed, and brings you an enterprise-class SSD for game and work. Maximum Reliability: Garbage Collection, TRIM, S.M.A.R.T support, End-to-End Data Protection, powerful AES encryption, advanced Wear-Leveling technology, MTBF>1,000,000hours(256GB), MTBF>1,200,000hours(512GB).